Both male and female harp seals return to their breeding grounds each year. Males compete with each other for access to females. 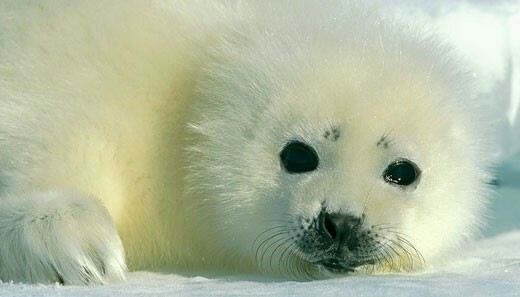 There are 3 populations of harp seals: the Greenland Sea, White Sea (off the coast of Russia), and Newfoundland, Canada. Greenland’s coast is the area of land which sees the highest number of harp seals. The scientific name Pagophilus groenlandicus literally translates as ‘the ice-lover from Greenland’. Harp seals have a range of vocal communications. Pups call to their mothers by “bawling”, and while playing will often “mumble”. Adults growl to warn away potential threats, and while underwater are known to elicit over 19 different calls while courting and mating. Harp seals spend relatively little time on land, preferring to remain in the oceans swimming. They are tremendous swimmers that can easily dive to depths beyond 300m. They can also hold their breath underwater for 15 minutes. Harp seals are sociable animals that enjoy the company of other seals. After mating is over, females form groups before giving birth. Harp seals give birth to their young on ice. Seal pups weigh around 11 kg at birth however during nursing when they are fed exclusively on their mother’s high fat milk, they quickly grow, gaining over 2 kg per day. Harp seals migrate up to 2,500 km from their breeding sites to summer feeding grounds. Despite global disapproval of the killing of seals, and numerous scenes of conflict between hunters and humane activists, hundreds of thousands are still killed annually. A recent EU ban on the importation of skins from harp seals is however a welcomed step forward in seal protection which should decrease the number killed each year.